Goth Gal is now live on Tapastic!!! Tapastic is a website/app I discovered today thanks to the lovely folks at Patreon …and cleaning out my inbox. 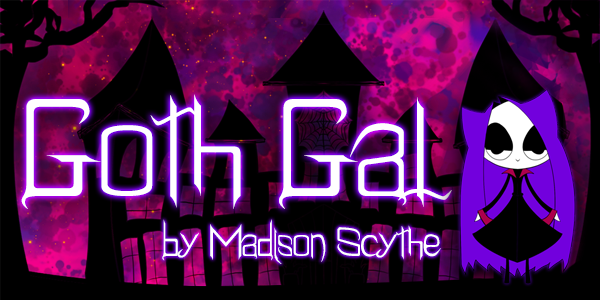 It’s a comic reader that makes it easy to access all sorts of wonderful comics and now Goth Gal will be in their library too. New comics will be posted there Mondays, Wednesdays and Fridays in addition to the website. I will also be adding revisions of older comics that will go onto Tapastic a month before the main Goth Gal site. To see them before anyone else, please follow the comic in the app. It would be a big help to me as well. Oh I was thinking about doing this, but then I wasn’t sure if it was worth it? Let me know how it goes for you!! Hope you make it to their front page! Also quick patreon question- when you signed up did you add all your older stuff? I’m not sure if I should go back and add older stuff or not? I will! And I’m planning on altering my older Goth Gal for COLOR and adding them to Tapastic. I just haven’t gotten that far LOL.